The Carolina Praying Mantis (Stagmomantis carolina) is a mantis species native to North and South Carolina- hence the name. However, this particular mantis species is actually found in a number of other states and can also be found in parts of Mexico and South America. The Carolina mantis is not the largest species of praying mantis whereby the male and female look very different from each other. The adult female has short wings and is big and beavy. The male has long wings and is small, light and much more active. The male is able to fly and will do so readily but the female is unable to fly. 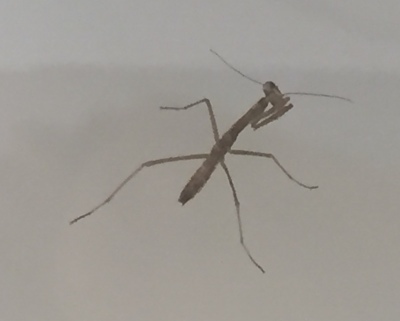 This species does not grow as largeas the Chinese mantis but we felt this particular species would be easy to raise and provide us with hundreds of baby mantis ("mantids") for our study. 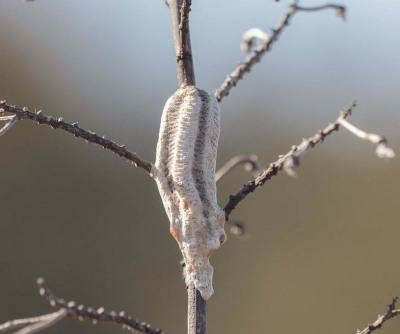 We selected the Carolina mantis for the simple reason that the egg casings were readily available for purchase. Typically, female do not lay eggs except during the months of January and on into April. We couldn't wait that long. Bobby and I purchased a ten gallon glass aquarium which will be used to house the baby mantids immediately upon hatching from their egg casings. 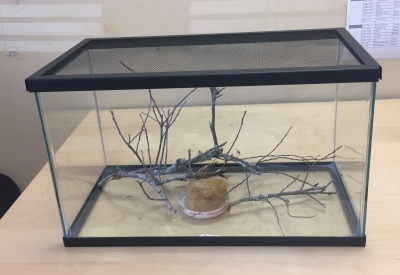 We have added some branches for climbing and a natural sponge for water. It make take weeks before our mantids emerge but we are ready. We have sealed the screen top with a paper towel which will allow fresh air to enter but prevent mantis escape attempts. Upon hatching, our baby mantids will be no larger than your finger nail. However, they are born natrual predators and will begin looking for food and moisture almost immediately. Praying mantis are usually cannabilistic not only during the mating season but throughout their lifespan. We are anticipating that our mantids will begin feeding on each other despite our attempts to teach them proper dining room etiquette and alternative food sources. Praying mantids are opportunistic feeders and will prey on just about anything that they can catch and subdue long enough to consume. 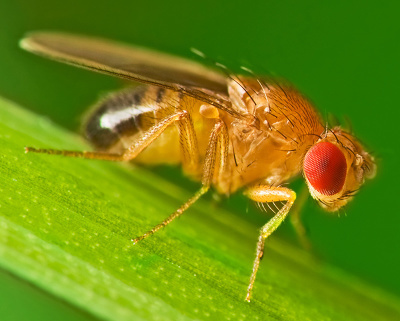 We are going to use wingless fruit flies (dropsifilia) as an initial food source since fruit fly cultures are generally easy to purchase and can be cultured in the science lab. However, mantis in the wild will consume just about any insect including ants, beetles, spiders, flies and small children. 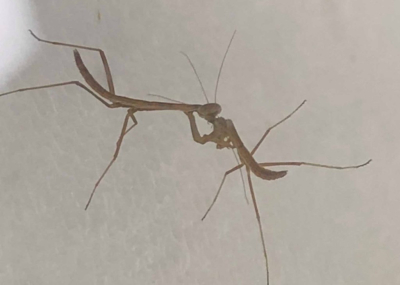 As luck would have it, our baby mantids began to emerge from at least one of the egg casings over the Christmas holiday weekend when nobody was present to witness their arrival. 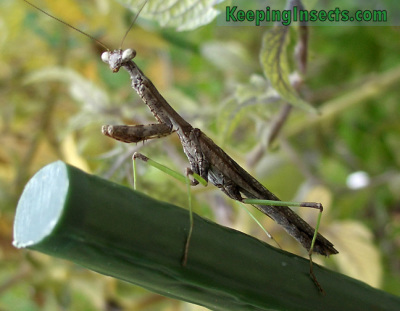 Regretably, we lost a number of newly hatched mantids due to dehydration within the first 24 hours. However, we were able to rescue a number of the little devils on the following Monday. During one of our last visits to the Mantis Nursery, we were happy to see that a number of the mantis had increased significantly in size. It was evident that they had discovered the fruit flies and were enjoying the benefits of a high protein diet. Pictured to the far right is one larger mantis consuming a smaller one, head first. Yummm.